This winter has been cold, and dreary, and long, and frankly I am a little sick of it. But there is still a while to go, so to lift my spirits and add a little color to my winter life, I made myself this scarf. It was high time I made something for me. 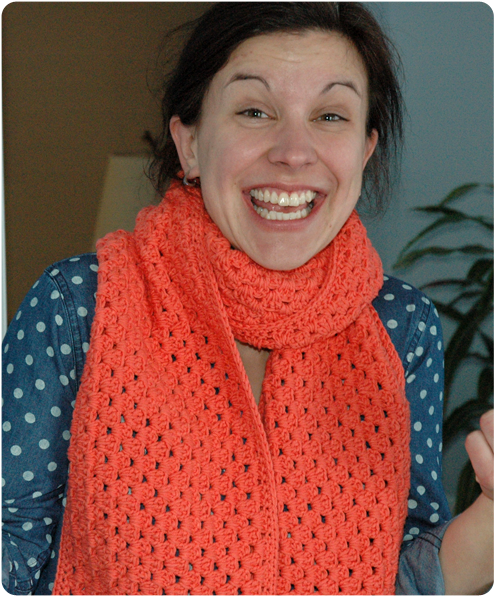 “Yes, a scarf for me, thank you very much” is what I told people when they asked what I was making. And it felt good to say that. So often us crafters are making for others that indulging in a make for ourselves is a welcome change, wouldn't you agree? 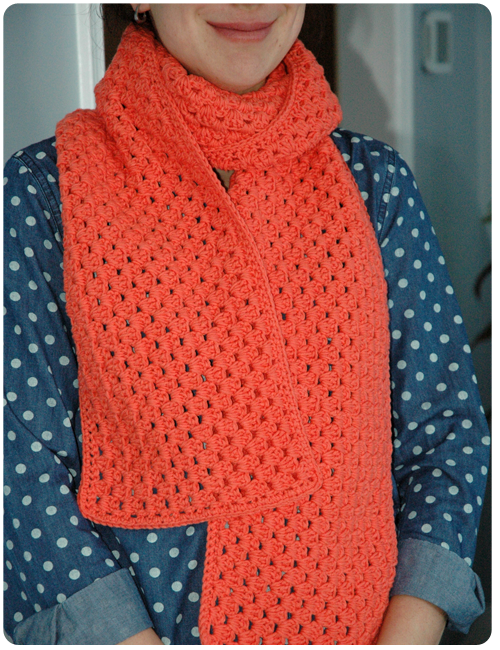 I used my leftover yarn from the girls' ponchos – a lovely orange color called Punkin. I chose to do a granny stripe pattern which I have tried several times before without much luck. I know it is a simple pattern, but in my previous attempts my work got all bunchy and would not lay flat. This time though things worked out lovely; what a soothing pattern to crochet. My gorgeous scarf, a definite burst of color to chase away the winter blahs and encourage spring to come just a little bit quicker. Such a pretty scarf!! Nice to hear that you made something for yourself and it is a great spring color. Will remind you that the warm weather is coming - hopefully SOON!!! Thanks Leslie. I have been wearing my scarf since the first official day of spring and even though it is snowing I feel a little better about the weather.